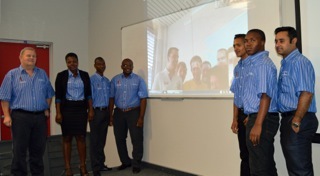 Faculty of Engineering and Information Technology at Central University of Technology, Free State (CUT) held an interactive lecture with ULM University in Germany – something never seen in the history of this partnership. The purpose of the lecture was to take a step further into the world of technology, establish academic information exchange programme and encourage closer co-operation between the two universities. The final year diploma students from both universities made 15-minute presentations to demonstrate the potential of the information technology as a powerful tool for teaching and learning. The topic choice was made earlier in the year by Mr Baby Kuriakose, student organiser from CUT and Prof. Walter Commerel from ULM university. CUT students presented the use of MATLAB™, a high-level language and interactive environment used by millions of students, engineers and scientists worldwide, to demonstrate how an industry related problem can be theoretically solved. Their counterparts in ULM University developed a laboratory model of the same problem and presented its analysis and design using Simulink™, a graphical tool of MATLAB™, which is used for modelling and simulating dynamic systems. Both universities plan to engage and share topics on a semester basis to encourage students to exchange and share information. In that way, students will be able to come up with new ideas of approaching real life engineering problems, which can be further explored. From left: Prof. Herman Vermaak, Head of the Department of Electrical, Electronic and Computer Engineering; Ms S V Maswanganyi, Mr TC Chauque and Mr LL Ramakhala. Right of screen: Mr N Jardine, S Memani and RB Kuriakose, student organiser; on screen is ULM University team under the leadership of Prof Commerel. 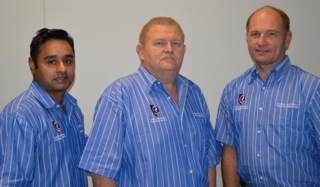 CUT’s team leaders; Mr Baby Kuriakose, Prof. Vermaak, and Dr Ben Kotze, Lecturer in the department.